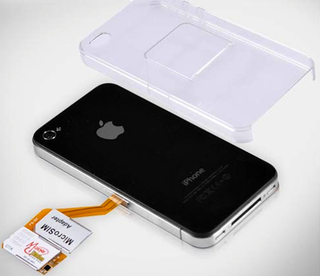 This transparent iPhone 4 case doesn't exactly look great, but it comes with a clever feature: A dual-SIM adapter. It means that you can keep two SIM cards attached to your iPhone and toggle between them using a menu setting. The adapter unfortunately doesn't allow both SIM cards to be active at the same time, but it's still a clever—albeit somewhat sloppy-looking—design. I'd just prefer the SIM cards to be hidden by an opaque case.